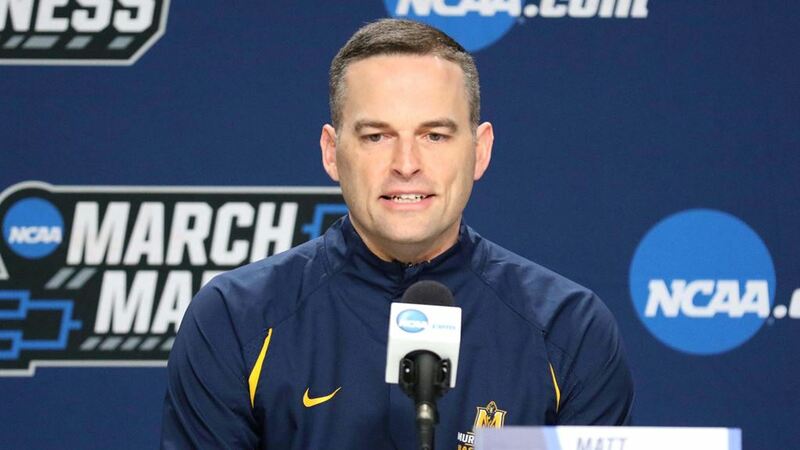 Murray State University Department of Athletics announced that Men's Basketball Head Coach Matt McMahon signed a new four-year contract taking him through the 2022-23 season. The agreement was ratified by the MSU Board of Regents at Pogue Library in Murray, Kentucky. "Murray State Basketball just completed a historic season and we are very appreciative of Coach McMahon's continued commitment to Murray State University," said Murray State President Dr. Bob Jackson. "Matt's values, ethics, leadership and player mentoring approach sets us apart as we provide opportunities for our student-athletes and advance our program to new heights. Also, we are grateful to Matt, Mary and their family and what they mean to our university community." "Coach McMahon and his staff have led our program to an unprecedented level of success," said Murray State Director of Athletics, Kevin Saal. "Building an elite program does not come without tireless commitment from high-character student-athletes and sacrifice, on behalf of our coaches' and staff families. Thank you to Dr. Jackson, the Board of Regents, generous donors, loyal season ticket holders and countless sponsors who facilitate our ability to match resources to expectations and retain dynamic coaches to lead all our programs. We're thrilled with Coach McMahon's commitment to Murray State University, as we build this players-first program together. "I would like to thank our players, assistant coaches, and support staff for their hard work that has led to these special seasons," McMahon said. "Thank you to Dr. Jackson and Kevin Saal for their leadership, vision, and commitment to our program. I would also like to thank our great Racer fans for their incredible support this season. I am extremely excited about the future at Murray State." McMahon's annual salary will increase to $500,000 per year. And if he chooses to leave and take a head coaching job somewhere he will owe the university $500,000.